In redesigning websites for 25 years, we have come to realize that a website is a machine for liberating prosperity and realizing institutional destiny. However making a business case for to ROI-minded, quant-driven business leaders (such as chief operating officers and chief financial officers) is trickier than it sounds, and is vastly different than making a case to marketing leaders who intuitively understand the value of a website. 1. Expected Increase in Right-fit Demand: stemming from improvement in historic website conversion rates, higher rankings on search engines, and reduction in website bounce rates. 2. Expected Increase in Brand Value: realized when the brand is modernized and strengthened as an integral part of the website redesign initiative. Stronger brands not only create brand distinction but also deepen brand equity. For higher education brands, this can be demonstrated by change in their US News & World Report and other reputation rankings. For b2b brands, this can be measured by change in their net promoter score and brand equity. In fact, Interbrand, a firm that evaluates financial value of b2b brands, confirms that the stronger the brand, the higher the financial valuation of the brand. 3. Expected Increase in Thought Leadership: based on increase in readership of opinions from your thought leaders, expanded exposure through social sharing, and increase in calls for expert opinion from media. 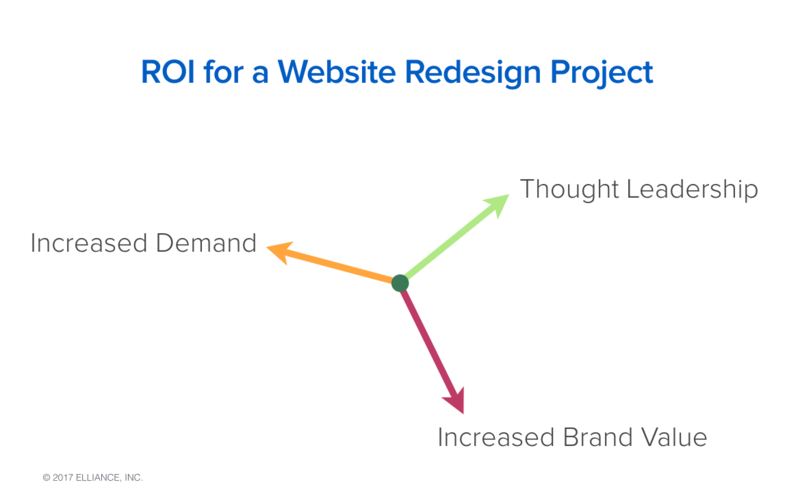 When clients gave us the opportunity to measure and compare the before-and-after metrics for their website redesign projects, it was clear that they positively generated significant ROI for them. In all these cases, the clients also confirmed that we changed their organizational trajectories. Before you redesign your website with an outside firm, be sure their approach aligns with your strategic objectives. If you are looking for a website that will create a new inflection point for your organization, please contact us. We promise we won’t disappoint you.